Food & Wine offers berry-topped tarts, fun carrot cupcakes and more spectacular Easter dessert recipes. Here are 10 of our favorite Easter dessert recipes, like classic macaron sandwich cookies. Fresh fruit, like luscious berries, stars in these delicious pies and tarts. Recipes like moist carrot cupcakes provide fun variations on a classic. These are the quintessential spring dessert recipes, from pineapple upside down cake to sweet cherry clafoutis. Here are more than 30 showstopping desserts, like a lemon bundt cake with crackly caramel glaze. Easter brunch should feature great coffee cake, like a Nutella-swirled version. 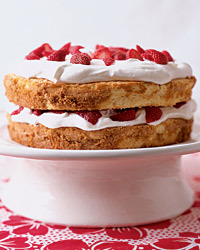 These mix-and-match cakes, fillings and frostings make a vast array of delicious layer cakes.